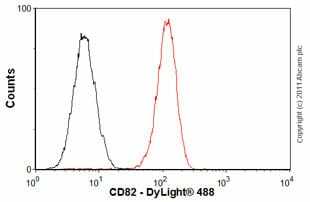 In the datasheet of this antibody show that“Specificity ：Recognises the CD82 antigen, a 60 kDa protein” Could you kindly provide the detail of this antigen，which cell line or tissue？why this antigen is a 60kd protein? 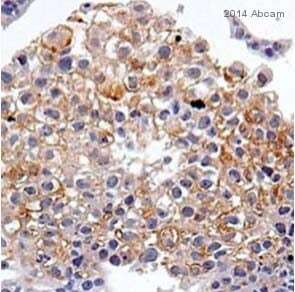 The theoretical weight of CD82 is around 34 kD (in reducing conditions) The band size is very difficult to determine because it migrates as a smear, due to high level of N-Glycosylation. This glycosylation could depend on the cell type and the state of the cell. So the range of migration is between 34 to 60 kD!